Hey everyone! It’s me, Jake, from Seika Town Hall. I just wanted to share with you a small part of American culture. 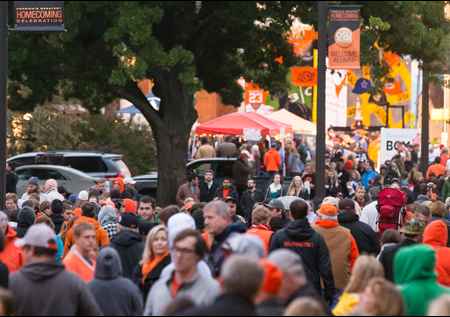 Every year around this time, many universities and high schools host an event called “Homecoming” which is a way of welcoming back alumni to visit the campus and enjoy some events. Homecoming usually lasts about one week. During the week, students and alumni wear T shirts bearing their school color every day. 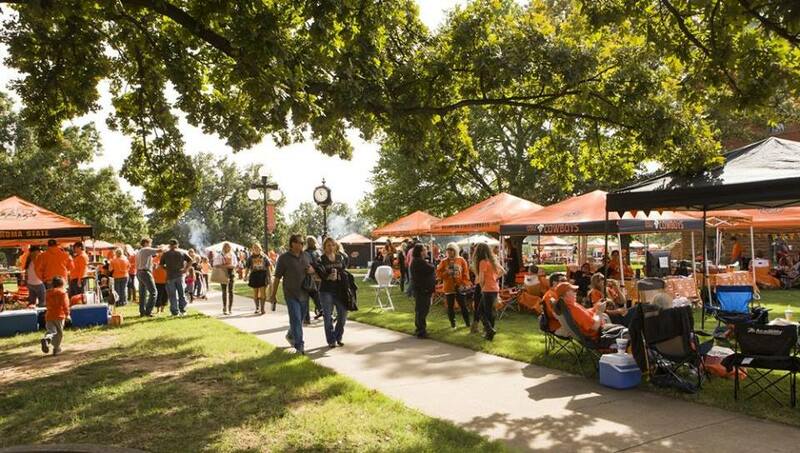 Between Monday and Thursday, there are various games and contests, and Friday is like a festival where people eat food from food carts and walk around campus. Finally, on Saturday morning there is a parade and in the evening a football game. It would be sad if your team lost on homecoming, so many schools choose a weak team for the game. Every school has their own customs. 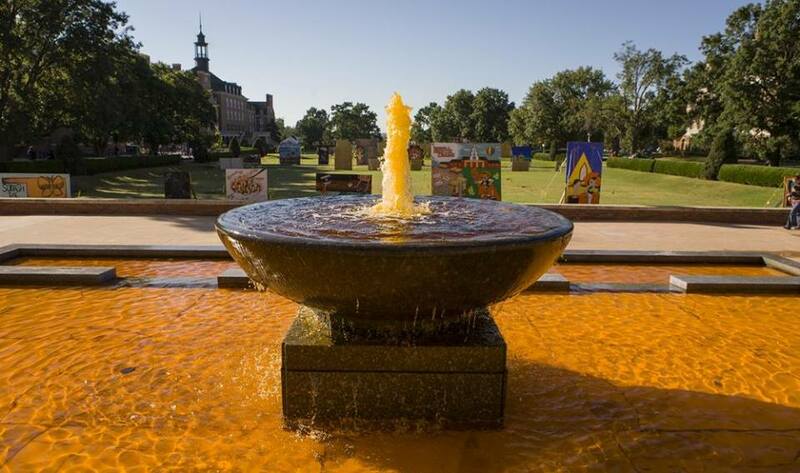 My school dyes the fountain in front of the library orange every year to match our school colors. Also, clubs and circles build big signs called “Decks” out of paper and compete with each other to see who has the most interesting deck. Every day is lively and fun. Once the game has started, all fans enter the stadium. 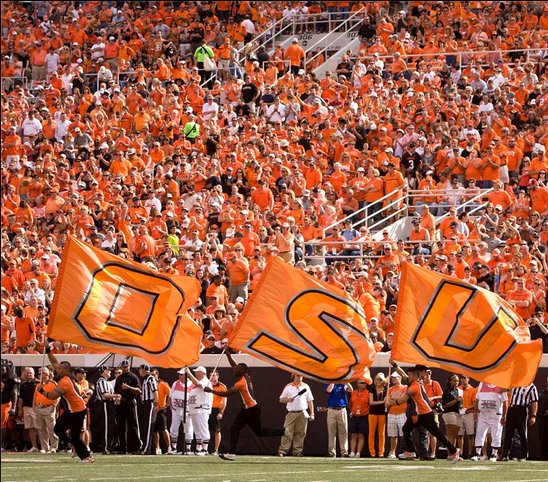 At Oklahoma State University, there are a lot of fans and they all wear orange so it looks like the inside of the stadium is dyed orange. This is called the “Sea of Orange.” All the fans stand together singing and shouting to support their team. It’s gives off a very exciting atmosphere. In the future, if you have an opportunity to go to the United States, Homecoming is not limited to just alumni and students, anyone can go, so please check it out! It will definitely be fun! 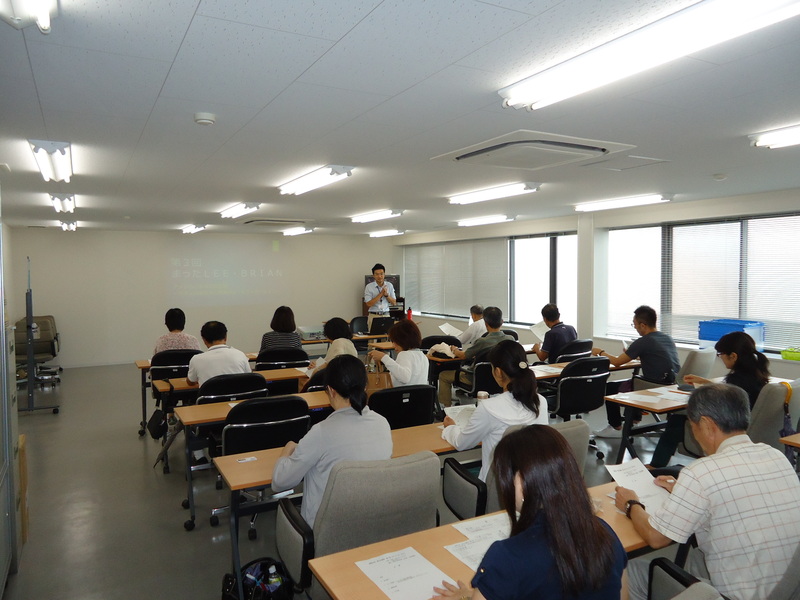 On September 25th, I had my third lecture in my Comfortab-LEE Brian series. And this time I talked about what everyone loves – food! “Do Americans eat hamburgers every day?” I have been asked that by several people half-jokingly. 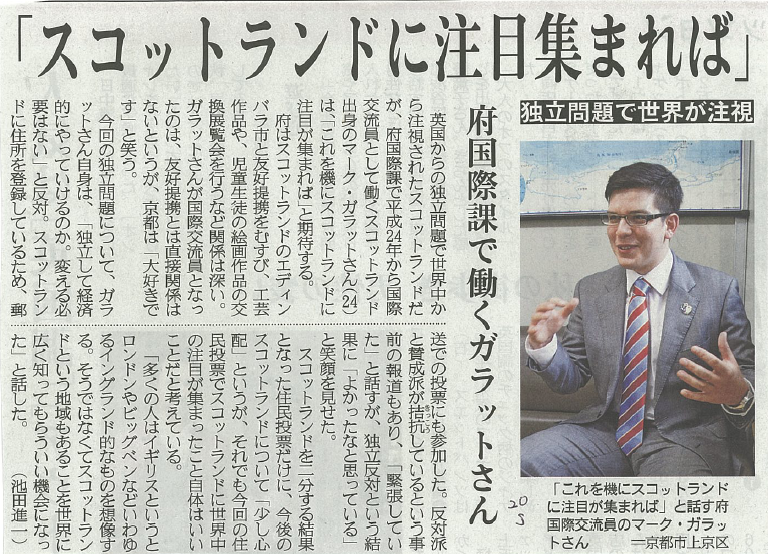 To show a better representation of the American diet, I interviewed the AETs of Kizugawa City about their daily meals. The answers were quite full in variety: cereal, pasta, beans, mashed potatoes, tortilla, rice, and etc. I also presented many local dishes and Americans’ favorites including: Buffalo wings, clam chowder, cheesesteak. And by introducing dishes such as spaghetti and meatballs and gumbo, I discussed the multicultural history of the US as well. 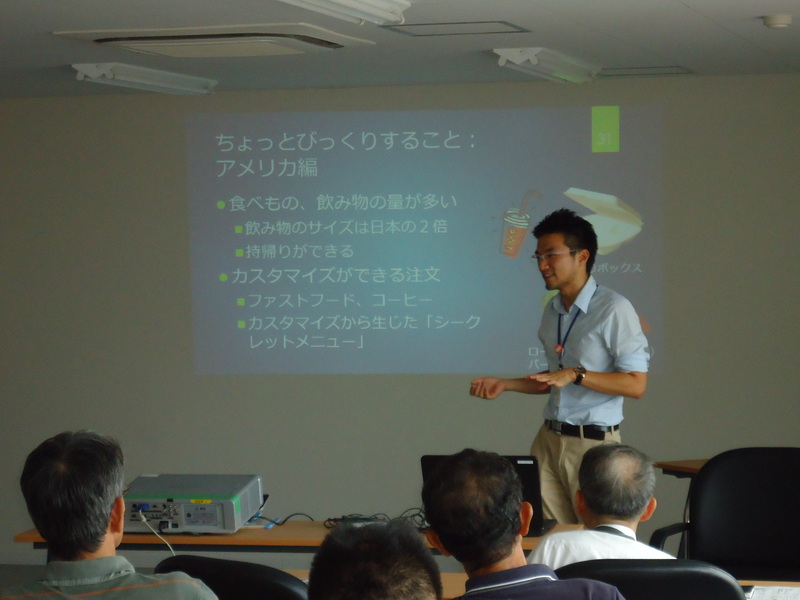 It was a fun talk, and by the end of my presentation, we were all hungry. 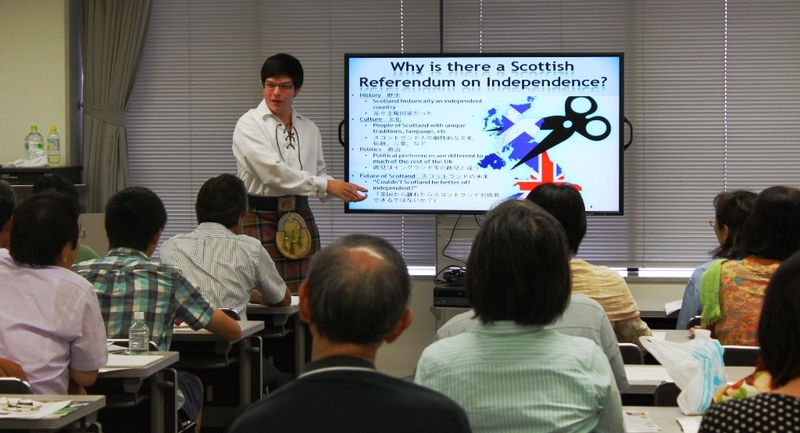 My next event is on November 27th, from 14:00 – 15:30. I’ll be talking about something… moving – cars and traffic! Hope to see you there! 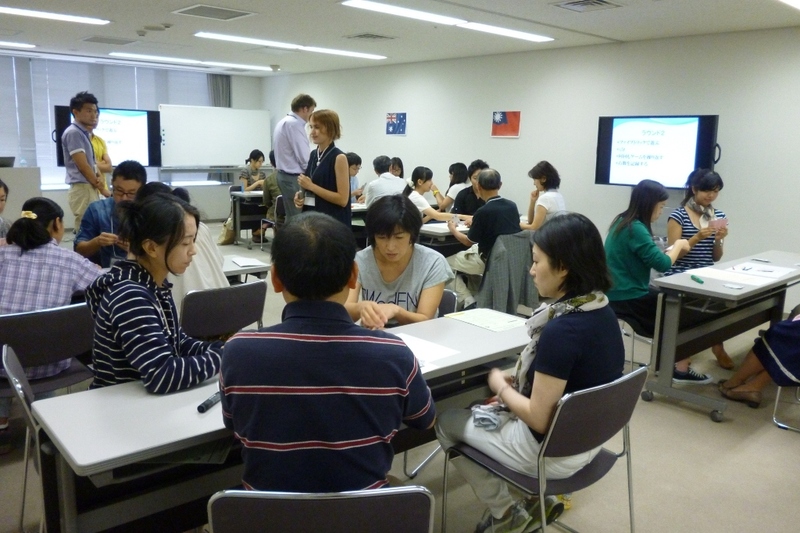 On September 13th and 14th, the International Cooperation Station was held on the 2nd and 9th floor of Kyoto Station. 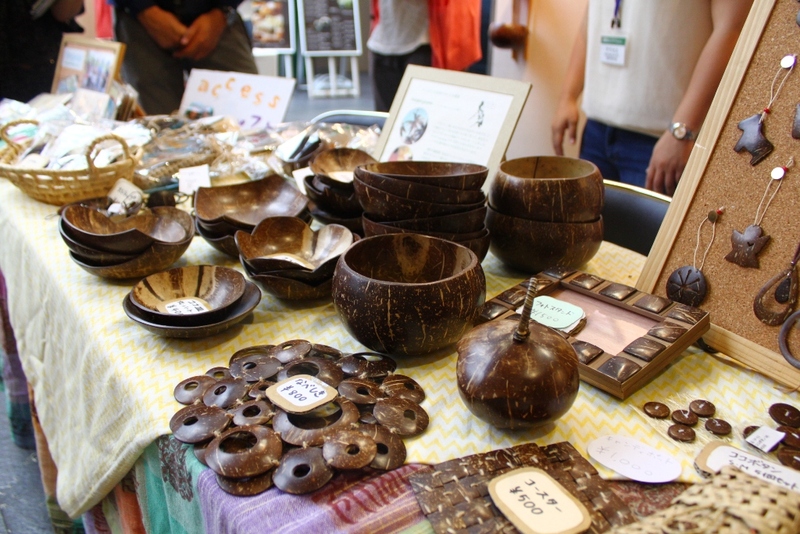 The 14th edition of this event was held during a beautiful autumn weekend in September at Kyoto station. Shedding light on social contribution activities at an international level with a focus on international cooperation, we choose to broaden the event to multiculturalism this year, with one organization representing Japanese language classes’ network in Kyoto Prefecture, and another one active in the field of supporting non-Japanese mothers in Japan among others. In total we had 19 organizations participating in this event. 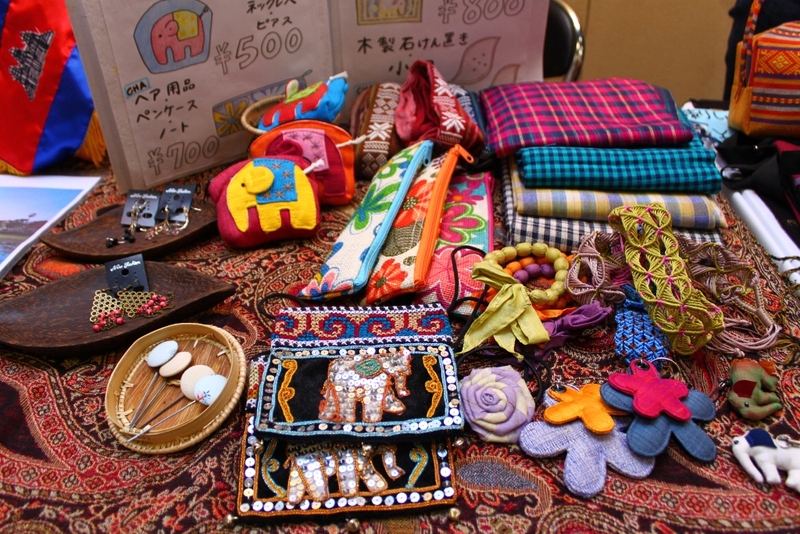 On the 2nd floor, booths with picture and panel exhibitions were set up and local craft goods were on sale in an open space. On the 9th floor at the Center, we had various activities going on: café corner with fair trade drinks, craft workshops where one could make foreign accessories and toys, an international cooperation consultation corner with specialists, as well as lectures on a broad range of topics. 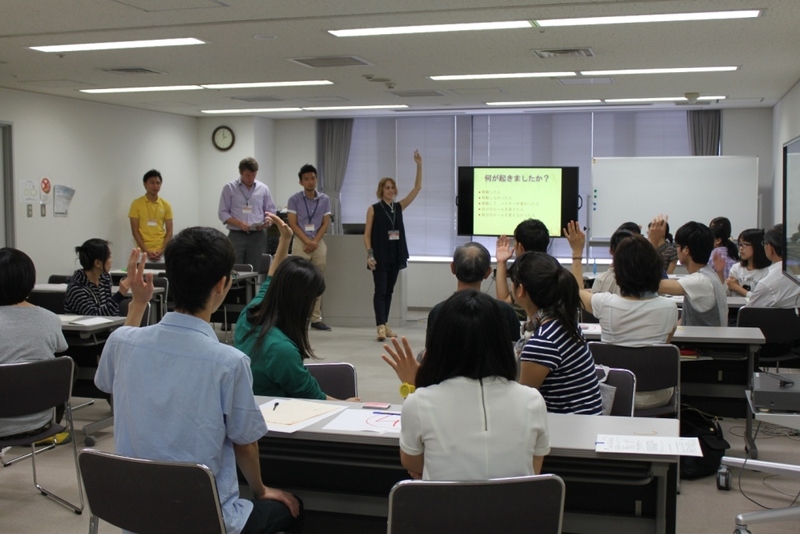 On the 14th, I organized an intercultural communication workshop called “Barnga” with 3 other Kyoto CIRs: Brian (Kizugawa), Jake (Seika) and Eric (Kameoka). In this workshop, participants experience the shock of realizing that despite many similarities, people of differing cultures perceive things differently or play by different rules. They learn that they must understand and reconcile these differences if they want to function effectively in a cross-cultural group. After the workshop we had a debriefing with everyone, and then had participants discuss into groups what they learned from the workshop and the talk afterwards. 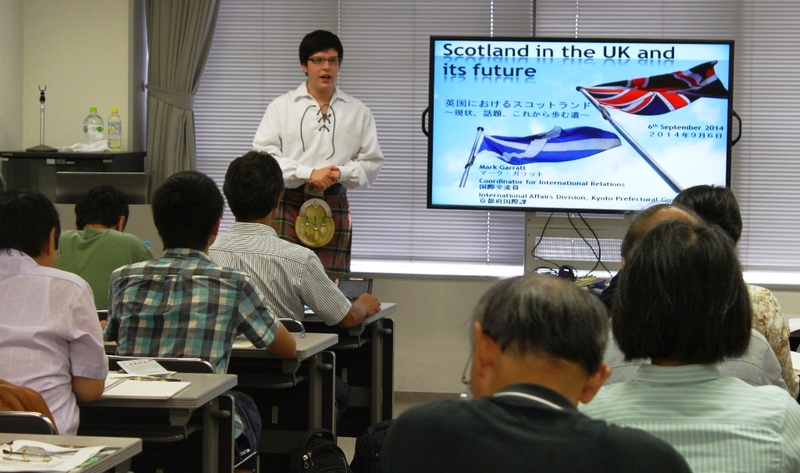 They then presented what they will be paying attention to and working for when dealing with different cultures (be it foreign cultures or different values shared by people of the same Japanese culture). I love this workshop because anybody can participate and gain something from it. 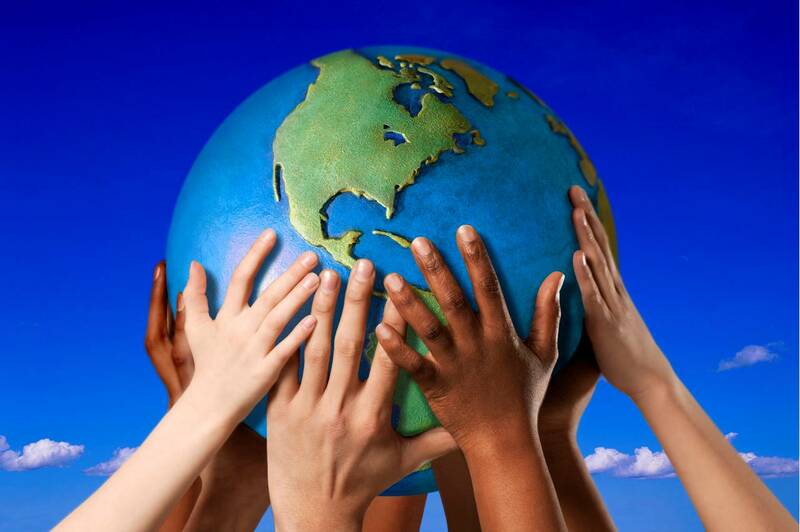 For people who have usually no interaction with foreign cultures, they can gain their first insight into multicultural society and communication, and use that knowledge when interacting with other people sharing the same culture and nationality but with different values. For people having lived abroad or used to deal with foreign cultures, it allows them to become aware of their unconscious feelings and natural reactions when confronted to cultural clashes, because of the casual nature of the workshop (game) removing cultural and moral barriers and enabling people to be their real self. 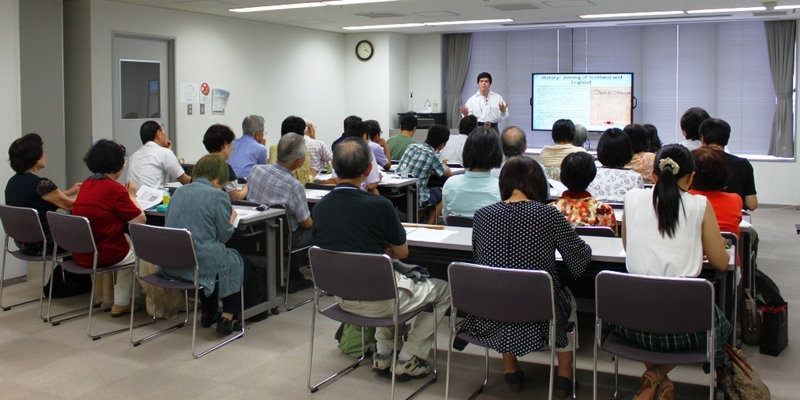 People were thrilled at the end and some even wanted to hold this workshop at their workplace. I will try to hold it again! With Barnga, we had our participants experience the many emotions that come with language and cultural barrier. Being the first time for me to participant in a game type event, I was worried at first whether it would resonate with the participants. However, I was more than happy to see participants actively sharing their feelings throughout the game and hear the rules of intercultural communication they came up with after experiencing Barnga. It was a great success! Barnga was a lot of fun! I was a bit surprised, but every table seemed to have their own way of solving problems, almost like a real country. For example, one table followed the rules of the eldest person, no matter what. Another table mixed the rules of the remaining players and the new players in order to continue playing. There were a lot of different reactions so it turned out really well. I got to talk with some of the participants afterwards and it seemed like everyone really got a good grasp of what multiculturalism. Even though I was staff, it was a valuable lesson for me as well.